Nettex Frog Health contains powerful antibacterial and antiseptic agents that promote hoof hygiene and help dry the frog. Standing in stables or wet fields for long periods of time can leave your horse at risk of developing hoof hygiene issues. Nettex Frog Health is ideal to be used regularly as part of your hoof hygiene regime to maintain healthy hooves even in challenging conditions. Highly effective antibacterial and antiseptic formulation. Will help maintain a healthy sole and frog all year round. Helps support foot health when faced with challenging conditions. Ideal for horses on box rest or living out in wet conditions. Use once weekly or as necessary to maintain good hoof health. Key ingredients: Powerful antibacterial and antiseptic agents. To prepare the hoof, scrub the hoof using Nettex Veterinary Surgical Scrub and dry the sole. 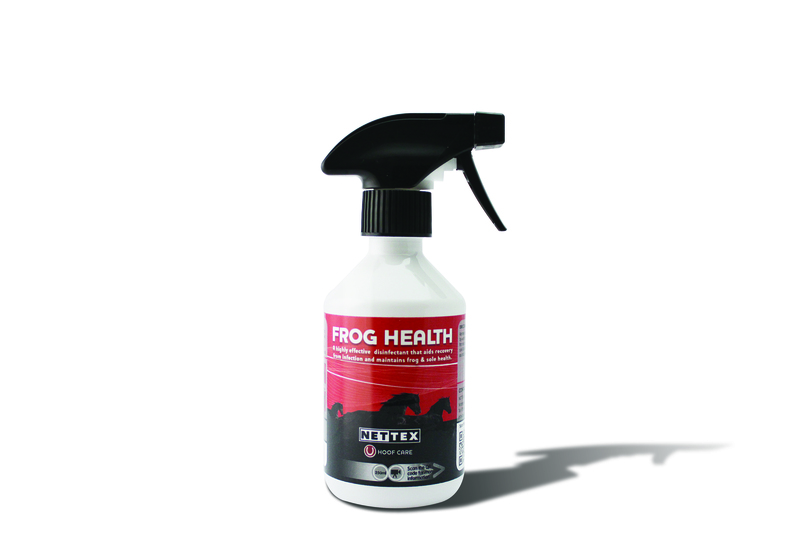 Spray Nettex Frog Health evenly all over sole of hoof and down each side of the frog. Hold the hoof up for a few minutes to allow Nettex Frog Health to penetrate. Stand horse on a clean, dry surface for 5 minutes after application allowing the sole to dry. If on box rest, or during long periods of stabling, Nettex Zeozorb can be used in conjunction with Nettex Frog Health to help provide a clean and healthy stable environment by reducing the build-up of soiled areas. Simply apply Nettex Zeozorb to stable floor and bedding once a week or as required. There are currently no questions for Net-Tex Frog Health Spray for Horses - be the first to ask one!